1. BGA rework system can ensure even heat distribution and right peak temperature and realize reliable lead-free soldering. Uses closed loop sensor and hot air top heater, sectional hot air for BGA, infrared heating part for complete PCB to prevent PCB from being deformation. 2. 60*60MM optical alignment lens, alignment of large BGA can still show clearly. Align glass is controlled by motor, and small plate for chips is placed above the glass. Special supporting rods can be placed in frame structure of PCB. The bottom supporting rods of BGA rework system are connected with landscape orientation rods to make sure accordance when place PCB. Fine adjustment of X, Y, Z, θ controlled by rocker, linear precision orbit and precision silk pole. Uses motor to control rough and fine adjustment. 3. 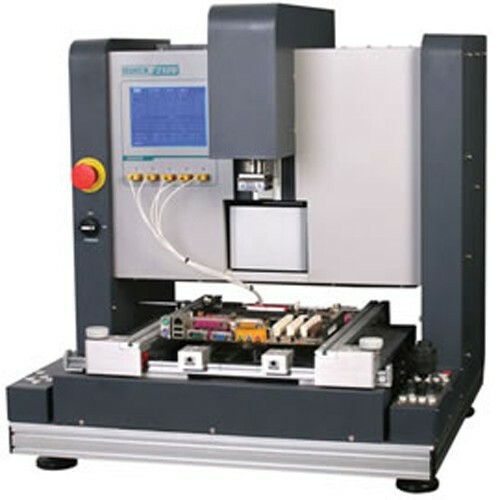 Except using manual fine adjustment of X, Y, θ in chip fine alignment, QUICK BGA2120 can automatically control the pick-up, placement and de-soldering of chips, movement of glass and heater, reflow control etc. which is unique in lead-fee rework systems.